As you may have noticed, I’ve been writing a lot about Windows 7 footprint reduction techniques lately. That’s because I’ve just finished moving my three production notebook PCs from conventional hard disks (with actual moving parts) to solid state disks. Because SSDs offer less space for more money (but also much faster speeds and improved battery life) it’s important to prune Windows 7 as much as you can when moving from a bigger drive to a smaller one. Through a major coincidence, for all three of those notebooks, this move involved downsizing from a 500 GB 2.5″ conventional HD to a 120 GB 2.5″ SSD. I document information about this effort in a series of blogs documented in a summary blog dated 9/22/2011 entitled “Noodling on Windows 7 Footprint Reduction for SSD Migration” right here. I’ve become so enamored of one of the tools involved, I want to introduce and illustrate it here, for the possible edification of and incorporation into the toolboxes of my readers. It’s a CodePlex tool (Microsoft’s free, open source code repository) named DriverStore Explorer (aka RAPR.exe). The program comes in a simple ZIP file, and only needs to be extracted into the folder of your choosing to be ready to run. That said, you might right-click this program, then select the “Run as Adminsitrator…” option from the resulting pop-up menu so it can do its thing properly at runtime. 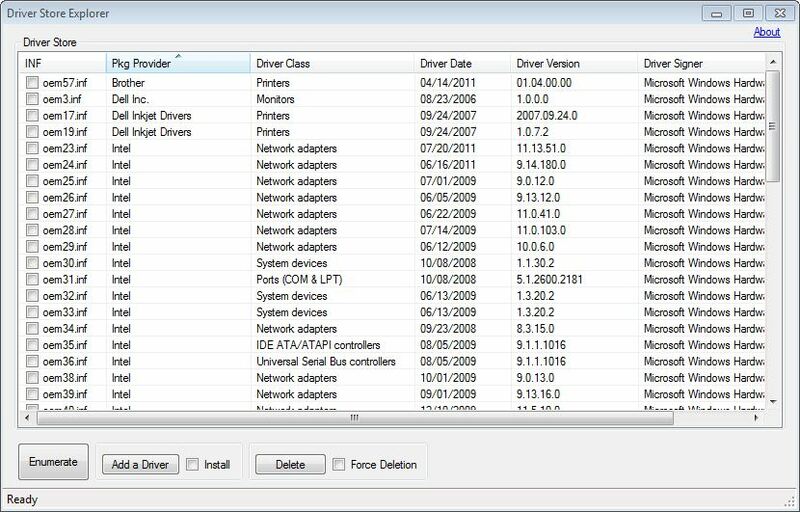 directory where Windows keeps all — and I mean ALL — of the drivers that get installed into a Windows operating system image over time. For an illustration of what this can mean, here’s a screen cap from the program taken from my wife’s hitherto untouched mini-ITX PC (a two-year-old installation upon which I’ve kept all drivers current since bringing it up in late 2009). As you can see from the screen capture, because of frequent updates to its built-in Intel Pro/1000 MT network adapters, there are seven (7!) different versions of the same network adapter driver present on this machine. My usual practice with drivers is to keep the current version, plus one version back: in case any bugs or gotchas should pop up for the current one, I can still use Device Manager to roll back to the previously used version. At 165 MB a pop, five unnecessary copies occupy 830 MB of disk space. All in all, I was able to remove 23 duplicate or obsolete drivers from that machine using DriverStore Explorer, for a net disk savings of 1.2 GB overall. Not bad, for 15 minutes’ time! Good idea to run this any time you’re massaging an image for repeated use or virtualization.